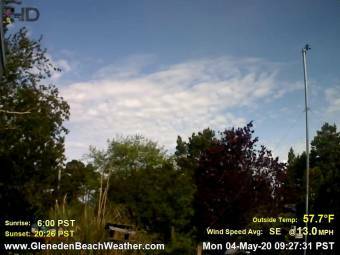 It's 12:22 in Gleneden Beach, USA right now. Coronado Shores Beach Club A webcam in Gleneden Beach, Oregon with image archive and current weather data. Lincoln City, Oregon: Career Tech Charter High School, 5.3 miles away. Cape Kiwanda, Oregon: Inn at Cape Kiwanda, 23.3 miles away. Valley Junction, Oregon: ORE18 at ORE22 - Valley Junction, 25.8 miles away. Bay City, Oregon: Weathercam, 44.8 miles away. Albany, Oregon: Weathercam Albany, 48.7 miles away. Yamhill, Oregon: NW Meadow Lake Road, 52.1 miles away. Tolovana Park, Oregon: Tolovana Inn, 68.5 miles away. Beaverton, Oregon: ORE217 at Allen, 73.6 miles away.